Shawls are the one garment that I have with me no matter the season. In cooler weather, they keep me warm when outside. In warmer weather, they protect me from getting too cold in air conditioned spaces. 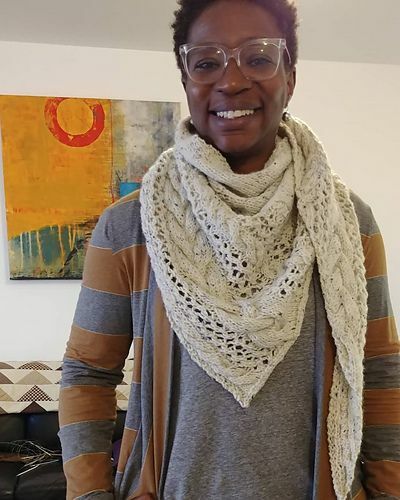 Since the weather seems to be very variable right now, with spring happening in full force in some places and snow hitting others, I thought it would be fun to check out some recently completed shawls. Each of these shawls features a openwork pattern, but they each have such a different style to them. I love the lacework on AstridSN’s Wild Swan, the fringe of MesPetitesTresses’ ¡piñas por favor! and the shape of CoyCrochet’s Varley Shawl. These Ravelers just look so happy with their shawls that they make me happy (and their shawls are each spectacular, as well). Tempesttea’s Lace Colorwork Shawl features beautiful color and texture, LarcYarn addition of fringe to her Inseparable is just perfect & I love the color of Victoria1720’s Hipster Shawl. If you’re in search of more shawl inspiration, you can check out more recently completed shawls in our project search!